Ahh, February is here, and with it we find the temperatures begin to get a bit warmer, and SunBird seems to be bustling with activities. January flew by for us as we welcomed 2017 with a fun party hosted by Irene Coatta and with the removal of our great Christmas display in the showcase by the library. We kept it filled with wonderful art created by individual members. This month, the Art Club has been gearing up to be ready for upcoming events. Starting February 23, we will begin showcasing this year’s art challenge. The subject is “Beaches,” which should bring a wide variety of ideas to put on canvas. This showing will continue through March 9 and is certainly worth pausing to look at the creative ways members express this subject. Also, we are once again having an art show in the Ballroom on Saturday, March 18. It has been a few years since we have held a show, and it promises to be a great event. So mark your calendars and come browse through some beautiful works. There will be a vast array of subjects presented in all forms of media; i.e., oils, watercolors, pastels, drawings in graphite, pen, colored pencil and just maybe sculptures. This is not only a way of sharing the talents of our artists, but there will also be a chance to maybe find that “just right” piece to purchase for your home or a gift for someone special. 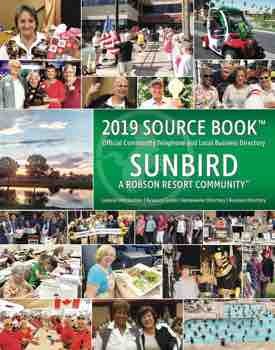 We look forward to meeting and chatting with our SunBird neighbors.